Although the United States has close historical ties to white supremacy, we have made efforts to distance our country from this ideology. But after the events of Charlottesville, it is impossible for any citizen to deny that these problems simply do not exist. White supremacist extremism, according to the FBI, poses a persistent threat of lethal violence. We have known about the dangers of these groups for years, but for many--myself included, we have not known how pervasive this culture actually is. Many cite Trump's rise to power as an authentication of white supremacist beliefs. Throughout his campaign, he was endorsed by several prominent individuals with strong ties to white supremacist groups, including former KKK Grand Wizard, David Duke. Whether or not these endorsements align with Trump's personal beliefs is irrelevant here. The point is his candidacy was filed with fear-mongering hate speech that incidentally gave these white supremacists validated forums where their beliefs were no longer seen as unimportant. After Charlottesville, news outlets differed monumentally on how these events were covered, primarily based on perceived party alignment. With headlines telling entirely different sides to an undeniable event, the truth of the matter becomes muddled. Take for example Trump's response to the attack and his statement that "violence was on both sides." Without immediately condemning white nationalists, many differing headlines surfaced: Fox News had this response, while the Washington Post had this to say. This is not a new phenomenon; news outlets have always changed perspectives on stories they report to better suit their followers. But it is disheartening to see that in today's volatile media industry, every disastrous event has to become a partisan issue. 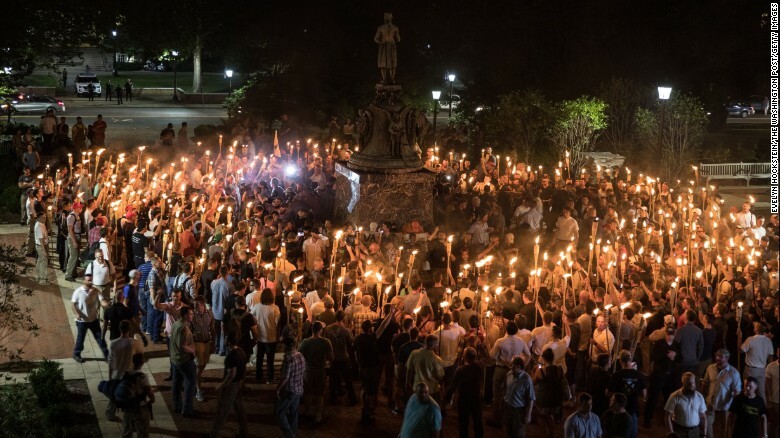 Until Charlottesville, I did not realize that major public figures--including prominent journalists, celebrities and politicians--would not vehemently condemn the actions that occurred. While it is doubtful the rhetoric in the country will change anytime soon, we are not without hope. News outlets will continue to post damaging articles aimed at causing major controversies. Sites like Breitbart and Shareblue will continue in their polarizing ways, to create dissonance among citizens. Fighting this mindset will be difficult. When major travesties occur within our country, we need to address all the underlying circumstances. This political warfare of 'he said she said' is offering no concrete details and only confusing citizens by the thousands. So many outlets are already locked in to their political alignment and that's unavoidable; we need a new generation of ethical journalists to rise and influence the political spectrum objectively. When one party calls out the other, no solutions are presented to prevent similar events to occur in the future. Targeting one another will only inhibit our abilities to ever progress toward a harmonious nation. Playing the blame game only digs us deeper into the moral hole we've dug; news casters and politicians simply deflect to other similar events that happened in the past. But that's the past; and it (it being representative of any tragic event/attack) happened again, and the underlying cause of the problem was never resolved. When did we quit caring about the safety of our citizens just so we can blame the other side?